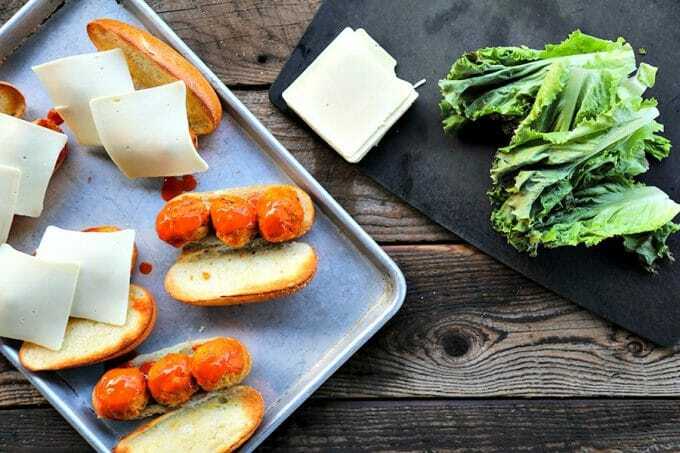 I am beyond thrilled to be partnering on this Ultimate Buffalo Chicken Meatballs Sub with Land O’Lakes® and The Feedfeed. 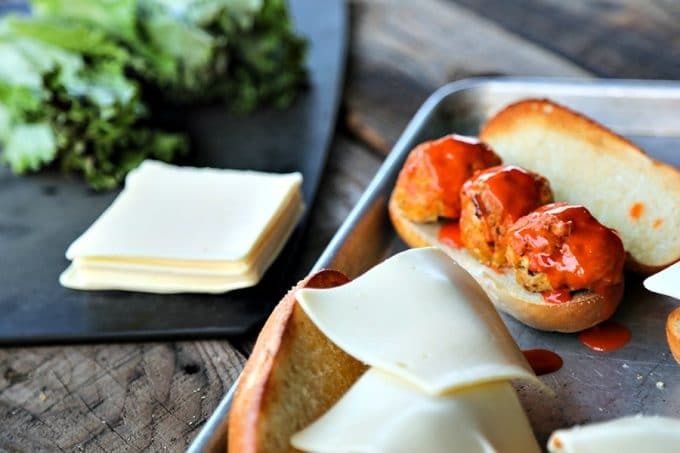 There is nothing that screams game day quite like these baked, buffalo sauce-infused tender chicken meatballs studded with sautéed celery, onions, and carrots and crumbled bleu cheese served on toasted submarine or hoagie rolls topped with creamy, perfectly melted Land O Lakes® Deli American. Let’s go, Buffalo! Despite living well outside the city limits, we consider Buffalo our home city. From the food to the people, from the ballet to the sports, and everything in between, we feel at home when we’re in Buffalo. …And since we’re mentioning Buffalo and food, we’re going to need to discuss wings. Because around here, we don’t call them Buffalo wings. We just say “wings”. And wings? Well, we’re pretty opinionated about them. If you’re going to get proper, classic wings in Buffalo, you’ll order them hot and they’ll be served with some cold celery and carrot sticks, and a side of bleu cheese dressing. That’s it. No more, no less. How do I avoid dry chicken meatballs? These classic wing flavours translate AMAZINGLY to the wonderful world of chicken meatballs. Instead of celery sticks and carrots on the side, we mince them up finely along with some delicious onion and sautee it in butter. This goes a long way to keeping your meatballs from being dry, which is sometimes a worry when using ground chicken. The addition of actual Buffalo sauce and eggs to the meatball mixture also helps ensure that our meatballs stay moist, tender, and flavourful. How do I make evenly sized meatballs? There are a couple of ways to do this. My absolute favourite way to make evenly sized and shaped meatballs is to use a disher; a.k.a. cookie scoop. This is a perfect way to whip up any size and any number of meatballs easily. If you don’t have a disher and don’t want to buy one, you can pat the mixture into an even rectangle and cut the rectangle into 6 rows by 4 rows, yielding 24 even sized meatball mix cubes. Roll each cube in your hands to form a ball, then voila! 24 perfectly even meatballs! What kind of Buffalo sauce do I use for Buffalo Chicken Meatballs? In short, whichever you like best. I’m partial to my homemade Garlic Buffalo Sauce Recipe, because garlic completes me. 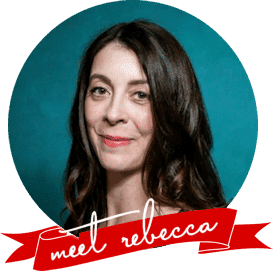 If you don’t have time to make your own, or you just plain don’t want to, there are several excellent brands available near the hot sauces in grocery stores. What kind of cheese should I use for meatball subs? Guys. This is a no-brainer. You need a silky, creamy, melty topper for your gorgeous Buffalo Chicken Meatballs Subs, and Land O Lakes® Deli American is the perfect choice. 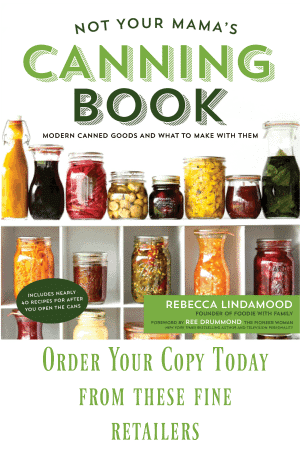 It is also perfect on top of burgers or in grilled cheese sandwiches, so you can’t go wrong buying more than you think you’ll need! It melts like a dream. End of story! As with any meatballs, you want to try to avoid over-working the meat mixture. Just mix until even, and use a spoon to do as much combining as you can before switching to your hands. These are designed not to dry out, so the meat mixture might seem a little wet to you. Don’t worry. As long as it holds together in the shape you give it, you’re doing a-okay. We’re not looking to make the onions, celery, and carrots completely soft. You’ll just sautee them long enough to make the onions translucent at the edges. Bleu cheese. It’s kind of crucial to the whole Buffalo experience. So use whichever crumbles you like best in here… the brand isn’t as important as its presence. Ditto the breadcrumbs. This recipe is designed to use Panko crumbs, but which brand and whether you use white or wheat or gluten free won’t make or break it. Buffalo sauce. I mentioned it in passing, but I like my homemade Garlic Buffalo Sauce the very best. That said, there are some good National and Store brands, too. Use the one you like the best. But if you want the REAL Buffalo experience, make sure it’s good and hot. 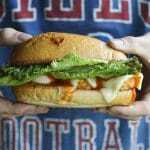 I like a fresh, soft-on-the-inside/crusty-on-the-outside hoagie or sub roll for our Ultimate Buffalo Chicken Meatballs Subs. I’ve also made them with the most perfect soft pretzel rolls or purchased or homemade burger buns and been a very happy camper. The real key here is buttering your buns and toasting them under the broiler before loading them up with your saucy chicken meatballs. It’s worth mentioning that these Buffalo Chicken Meatballs freeze and reheat like a dream, so I always make more than we need for one meal. 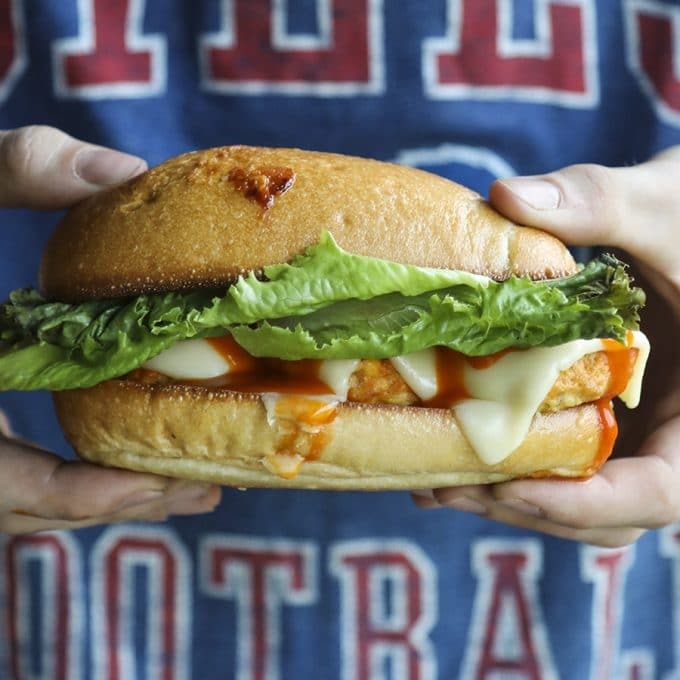 Looking for something to serve with your Buffalo Chicken Meatball Subs? I love them with Spicy Bacon Cheddar Pasta Salad, Loaded Baked Potato Salad, Cranberry Pistachio Snack Mix, Berry Kombucha Margaritas, Ada and Anna’s Maple Sandwich Cookies, Caramel Apple Oatmeal Cookies, Easy Double Chocolate Nutella Cookies, Selfish Bars- Chocolate Caramel Sugar Cookie Bars, or Buffalo Blue Cheese Popcorn. 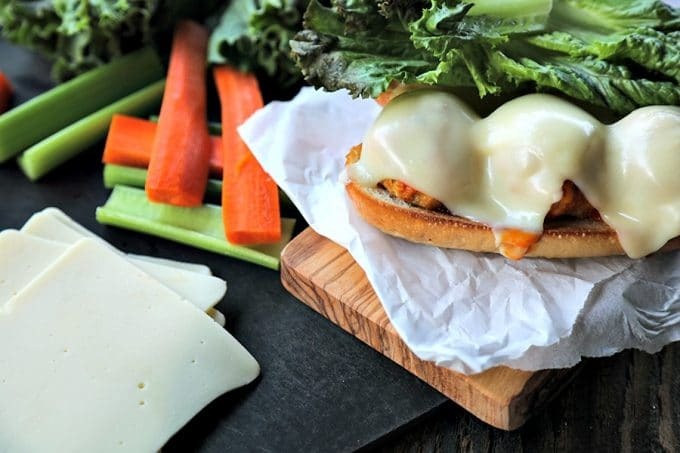 Baked Buffalo sauce infused, tender chicken meatballs studded with sauteed celery, onions, and carrots and crumbled bleu cheese served on toasted submarine or hoagie rolls topped with creamy, perfectly melted cheese. Game Day Perfection! Preheat oven to 400°F. Line a rimmed sheet pan with parchment paper and set aside. Melt the butter in a heavy-bottomed small saucepan over medium heat. Add the finely diced onions, celery, and carrots. Sprinkle with the salt, and stir to evenly coat everything in the melted butter. Lower the heat and sweat the mixture for 4 to 5 minutes, or until the onions have become translucent at the edges and the carrots and celery have softened slightly. If the mixture dries out before you can reach that point, you can add 1 teaspoon of water at a time until the carrots and celery reach that stage. Add the garlic to the pan and stir, cooking just until aromatic; about 1 to 2 minutes more. Transfer the mixture to a large bowl. Let it rest for 5 minutes to cool. Add the 1/2 of a cup of the Buffalo sauce, panko bread crumbs, and eggs and mix thoroughly. Add in the ground chicken, bleu cheese crumbles, and chopped parsley and mix gently until even. Using a disher or cookie scoop for ease, divide the mixture into 30 meatballs, rolling each one gently to help shape it. Place them onto your prepared baking sheet with at least an inch of space surrounding each meatball. Using another 1/4 cup of the Buffalo sauce, gently brush the tops of the meatballs. Bake for 14 to 16 minutes, or until a thermometer inserted in the center of a meatball reads 165°F. Transfer the meatballs to a large, heatproof mixing bowl. Pour the remaining 3/4 cup of Buffalo sauce over the meatballs and gently toss to coat. Preheat the oven broiler with a rack 6 to 8 inches below the burner. Open the rolls and lay them out -cut side up- on a sheet pan. Brush the rolls with the melted butter. Broil for 2 to 3 minutes, watching carefully to avoid burning, or until the rolls are light golden brown. Remove the pan from the oven. Lay out 4 to 5 meatballs on the bottom half of each roll, drape 2 slices over each meatball sub, and return to the broiler just until the cheese is melted. Arrange a slice of lettuce on each sandwich. If desired, drizzle with additional Buffalo sauce before serving with plentiful napkins! Oh boy, oh boy, oh boy. Making these for sure!